Eating a clean, nutrient-rich diet and maintaining an active lifestyle is important at any age, but even more so for seniors. As we age, the body undergoes a number of changes, from how well it produces and absorbs nutrients to changes in bone and muscle mass as well as appetite. Many people find that after a lifetime of enjoying high protein and starchy meals like meat and potatoes, an elderly loved one is suddenly no longer able or interested in eating the foods they once enjoyed. A geriatric diet plan designed to meet a senior’s current dietary and health needs can ensure they get the nutrients they require to stay healthy and continue to enjoy and look forward to their meals. In addition to physiological changes, the senses of taste and smell also change as we age. So if you find that your loved one once enjoyed the smell of your perfume and the taste of your meatloaf but is suddenly put off by both, don’t take it personally! The key is to adapt and adjust meal plans to meet a senior’s current health needs and personal preferences. Lifestyle factors, physical fitness, mobility and medication will affect a person’s nutritional needs and appetite. A comprehensive meal plan that incorporates an adequate dose of vegetables, protein, vitamins and minerals and good fats can help keep your loved ones healthy and active. These healthy foods can also potentially prevent the risk of high blood pressure, diabetes and heart disease. Make sure they are getting enough calcium, B12 and vitamin D.
Choose lean proteins from sources like beans, fish, eggs, nuts, chicken and beef. Red meat should be consumed in moderation. Ensure they are getting enough fiber. Be certain they are drinking enough water and staying hydrated throughout the day. Have fun! Experimenting with new recipes is the best way to find meals that they will enjoy and look forward to eating. Adding more fruit, vegetables and good fats, from foods like nuts and avocados, is a good way to pack in nutrients and accommodate a senior’s appetite. 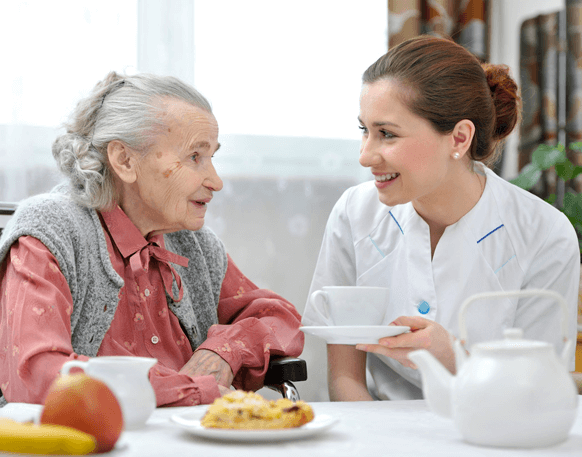 Active Home Care provides compassionate and comprehensive senior care services designed to help meet your loved one’s needs, and we offer support and peace of mind for the entire family. Our services are available in Miami and the surrounding areas — including Aventura, Coral Gables, North Miami, Bal Harbour, Cutler Bay and all of South Florida. Contact us today by calling 786-360-3449 to learn more.